For a long time chemistry has been associated with dirty and polluted environments. Fortunately, during the last ten years, a progressive trend has been occurring toward sustainability and green chemistry. In this context, the need for ecofriendly methodologies to prepare inorganic materials has been emerging gradually, especially when these materials are used for energy and environmental applications. Solution combustion synthesis is a very well-known methodology for the synthesis of inorganic materials, based on the principles of sol-gel chemistry and propellant chemistry . Rapid, efficient, reproducible, scalable, with time and energy saving, SCS also favors the formation of defects, metastable phases and of nanostructured features. Moreover, most of the requirements for catalysts and electrocatalysts (i.e. high porosity, large surface area and high defectivity) are easily satisfied using SCS. More importantly, it has been demonstrated that SCS can be used with insoluble precursors  and with waste-derived raw materials . 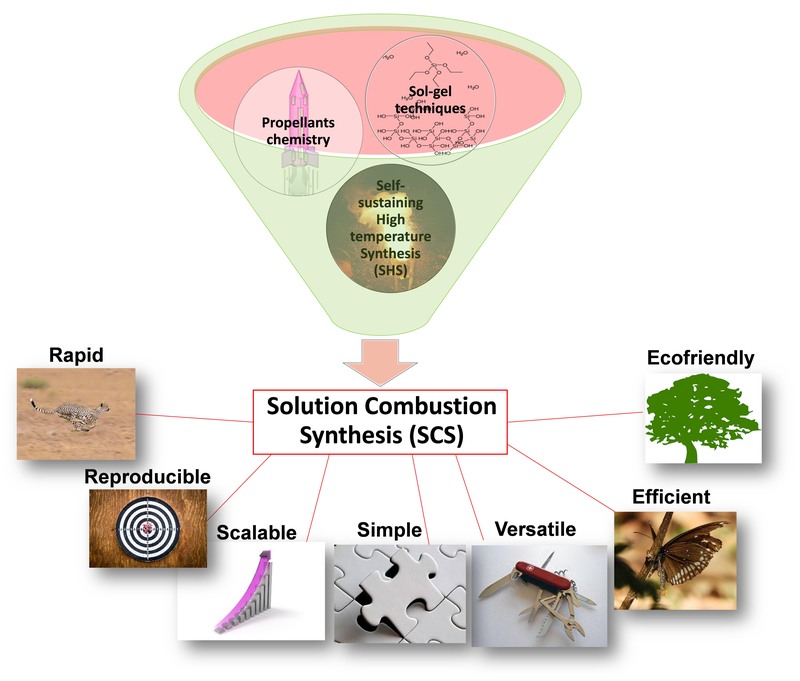 This presentation highlights all the sustainable and ecofriendly aspects of solution combustion synthesis as a valuable tool for the preparation of inorganic nanomaterials for energy and environmental applications. The main advantages of SCS are illustrated with examples from the recent literature. Special attention is paid to the use of waste derived precursors in SCS. Figure 1. 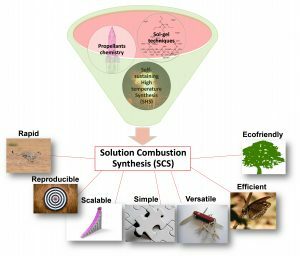 The groundwork and the features of solution combustion synthesis. A. Varma, A. S. Mukasyan, A. S. Rogachev, K. V. Manukyan, Solution Combustion Synthesis of Nanoscale Materials, Chem. Rev., 116 (2016) 14493-14586. C.-G. Han, N. Sheng, C. Zhu, T. Akiyama, Cotton-assisted combustion synthesis of Fe3O4/C composites as excellent anode materials for lithium-ion batteries, Materials Today Energy, 5 (2017) 187-195. F. Deganello, M.L. Tummino, C. Calabrese, M.L. Testa, P. Avetta, D. Fabbri, A. Bianco Prevot, E. Montoneri, G. Magnacca, A new, sustainable LaFeO3 material prepared from biowaste-sourced soluble substances, New J. Chem., 39 (2015) 877-885.